Valid driver's license required - CDL preferred. Experience in plumbing, piping, some electrical, and service meter knowledge preferred. Responsible for turn-on and turn-off (installation and removal) of new and existing gas and electric meters. Inspect construction while new facilities are installed. Create and maintain all associated records. Be on call 24/7 to respond to gas/odor calls inside of customer facilities and outside of company facilities. Must properly investigate and classify the hazard within company-specified time frames. Respond to underground facility locate requests to locate and mark-out all company facilities. Conduct reading of meters. Perform some "fitter" type work. Perform required periodic system inspections and surveys. Perform inspection, testing, and maintenance of gas regulators, meters, heaters, filters, etc. Maintain inventory of materials associated with operating a gas and electric utility. Perform basic gas facility design and permit work. Investigate electric customer inquiry calls during normal or off-hours. Minimum of three (3) years prior experience and training in excavation, road or utility construction with an emphasis on gas installations, plastic pipe installation, welding, and steel pipefitting. Gas Inspectors will be required to oversee construction projects on Gas Transmission and⁄or Distribution pipelines, gate stations, district regulator stations and downgrades. Inspect work performed by construction contractors and supervised by Company representatives assuring adherence to Company specifications, proper work methods and appropriate use of facilities and equipment. Have a minimum of a High School diploma or G.E.D. Gas Inspectors must possess a valid driver's license. Must be able to read and interpret drawings, maps, plans, specifications and procedures. Inspectors are responsible for all asset recording including, but not limited to: joints, 90's, tees, services, valves, 511's, pipe sections and as-builts. Be knowledgeable in the requirements of OSHA. All inspectors will be required to ensure that any job they're overseeing is maintained in a safe manner and meets or exceeds Company safety and environmental policies and procedures. Inspectors will need to make sure contractor's equipment is being used within their limits. Gas Inspectors must be able to understand and implement all Environment, Health and Safety Plan (E-HASP) requirements. Ensures that each contractor complies with the respective environmental rules and regulations for each respective project location. Each Gas Inspector must possess the ability to understand, follow, and execute detailed procedures needed to tie-in new gas facilities, and be able to recognize abnormal and unsafe conditions. Must be able to document, prepare as-built drawings and attend to all field work such as pressure testing, thermal fusion, cathodic protection, etc. Gas Inspectors must be able to understand and use gas-testing equipment, i.e., pyrometers, combustible gas indicators (CGI or GMI), etc. Inspectors must also be capable of locating underground utilities using maps and measurements, a split box, minesweepers, etc. Minimum of two (2) years prior experience and training in underground utility corrosion prevention. Ability to read and interpret gas and underground electric maps. Ability to use locating equipment such as split boxes, metal detectors. Read and diagnose CP test stations and readings. Troubleshoot damage and broken CP stations and oversee the proper placement and installation of sacrificial anodes. Be knowledgeable in the requirements of OSHA (training provided). Have strong communication skills to interact professionally, on a daily basis, with Company personnel, customers, State or local Municipal representatives, and contractor agents. Have strong organizational skills to complete daily paperwork, maps and documentation with a clear comprehension of construction units of measurement. Minimum of a High School diploma or G.E.D required. Valid drivers license and properly insured and registed vehicle. Minimum of three (3) years prior experience and training in excavation, road or utility construction with an emphasis on electric installations, plastic pipe installation, welding, and steel pipefitting. Inspectors will be required to oversee construction projects on Overhead and Underground Electric Transmission, Substation, Overhead and Underground Distribution, Environmental, Facilities and other types of electric utility projects. An Inspector may be required to oversee multiple construction projects at varying stages at one time (from designing to completed final folder close out). Required to inspect work performed by construction contractors and supervised by Company representatives assuring adherence to Company specifications, proper work methods and appropriate use of facilities and equipment. Must be able to read and interpret drawings, maps, plans, specifications and procedures. Must possess the ability to keep accurate and detailed field records including daily job reports, material usage and locations and field test records. Be knowledgeable in the requirements of OSHA (training provided). All inspectors will be required to ensure that any job they're overseeing is maintained in a safe manner and meets or exceeds Company safety and environmental policies and procedures. Inspectors will need to make sure contractor's equipment is being used within their limits. Should have strong organizational skills to complete daily paperwork, maps and documentation with a clear comprehension of construction units of measurement. Must be able to understand and implement all Environment, Health and Safety Plan (E-HASP) requirements and ensure that each contractor complies with the respective environmental rules and regulations for each respective project location. 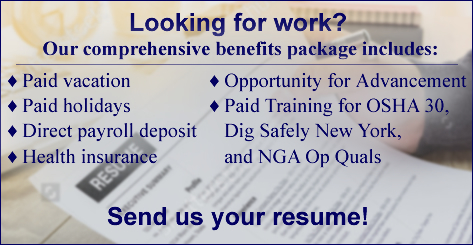 Minimum of a High School diploma or G.E.D., or equivalent work experience. Working knowledge of the utility industry and managerial skills a plus. Minimum of 2 years prior experience and training in Vegetation Management and Tree Care industry. Be knowledgeable in the requirements of OSHA 1910.269. Be knowledgeable in the requirements of ANSI Z133.1, ANSI A300 (Part 1), and ANSI A300, (Part 7). Be knowledgeable in the requirements of International Society of Arboriculture (ISA) Best Management Practices for Tree Pruning, Utility Pruning of Trees, and Integrated Vegetation Management. Be proficient in Tree Identification in all seasons. Have good communication skills, and be able to interact clearly with utility, contractor, municipal, and landowners representatives. Have good organizational skills, and be computer literate in Word, Excel, and Outlook applications. International Society of Arboriculture Certified Arborist and knowledge of herbicide application desired. Basic understanding of electric utility operation and infrastructure desired. Minimum 2 years experience and/or training in the utility industry. Perform field inspections and oversee 3rd party contractors during excavation projects. Strong communication skills to interact professionally, on a daily basis, with Company personnel, customers, State or local Municipal representatives, and contractor agents. Strong organizational skills to complete daily paperwork, maps and documentation with a clear comprehension of construction units of measurement. Must have knowledge of OSHA rules & regulations (will train). High School diploma or G.E.D. or equivalent work experience. and/or distribution pipelines in the New York City and Westchester County, NY areas, utilizing all hardware and software provided. Acquisition of GPS coordinates will be required. Knowledge of gas installations and/or plastic fusion preferred. Must be able to read and interpret drawings, maps, plans, specifications and procedures.